There's no mystery there as Jason and Jake's grandfather is Paul Brown, inventor of the Corky Lures. They spent a lot of time early on in Paul's shop, helping out and learning what it took to create fishing lures. This experience served them well as they set out on their own to create their own fishing lures and their own business. From this response and the overall impression from talking with Jake, it sounds like a lot of the differences come from starting a business in 2006 vs. starting one in 1974 when Paul Brown's B&L Manufacturing business started. The Brown brothers knew the power of the internet, and with little capital to make a big marketing or production splash, decided to market via their website and to independent stores at the outset. This business outlook was different from their grandfather's, and Brown Lures was born. 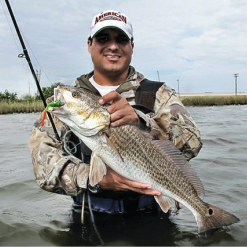 Here in Texas, we've seen the Sea Devils from Brown Lures for a while, and then an interesting creation called the SOLO. The most popular offering has definitely been the Devil Eye, a larger mullet imitation with a pronounced eye reminiscent of the Corky lures. The popularity of the Devil Eye lead to an opportunity with Academy Sports and Outdoors, the largest outdoor retailer in the region. When asked what this meant for their business, Jake responded, “It's been a HUGE deal getting them into Academy.” They've had to work out some kinks in their business operations to keep up with demand, but it seems like the Brown brothers have caught up and have made the necessary adjustments. This also bodes well for their future business as Academy expands East into Louisiana, Alabama, Mississippi, and Florida. They've recently completed renovations and upgrades to their production facilities, and have developed internal software to better serve their customers, forecast demand, and analyze their marketing expenditures. Jason and Jake Brown of Brown Lures have made their own impact on the Saltwater Fishing Texas landscape, combining their family history with some 21st century business savvy. And all this by the ages of 25 and 21. Here's hoping that they stick around for a good long while and continue to produce effective fishing lures and tackle. 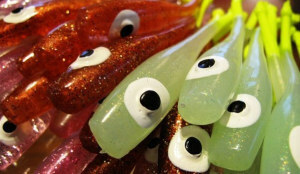 We'll be keeping up with Brown Lures and reviewing their paddle tail offering when it comes out in the Spring. 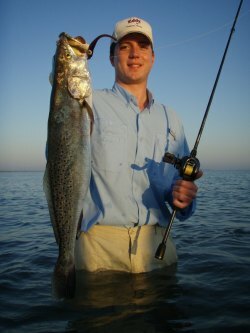 They will be selling them at the Fishing Tackle Unlimited Booth at the 35th Annual Houston Fishing Show at the George R. Brown Convention Center March 3 – March 7, 2010. Be sure to visit their website for the latest information and the wide range of colors available for their popular and effective Devil Eye soft plastic and the tru-lock jigheads to go with them. Jason and Jake are also contributing to our article on fishing and working artificial lures. Stay tuned! Return from the Brown Lures page to the Manufacturers page.